As noted from the multiple batches of cake batter bark, cupcakes, and the cake batter cookies I’ve made over the last few months, my obsession continues. 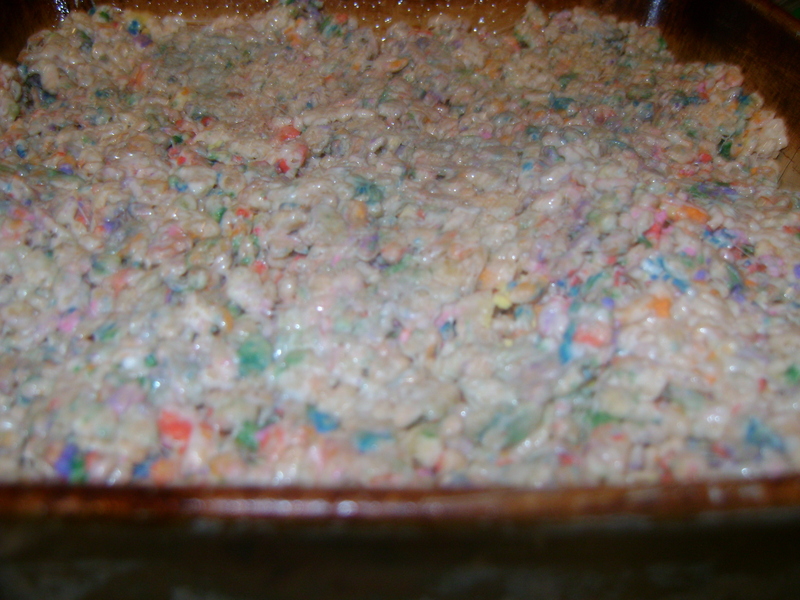 And after I saw this recipe, my love of cake batter grew even deeper. Instead of your standard cookie or cake, why not twist an old childhood treat into a new birthday cake favorite? 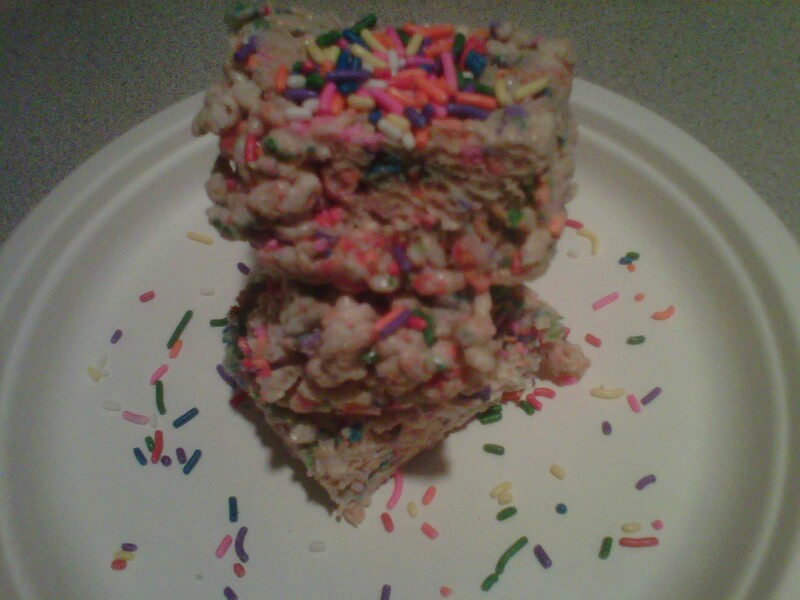 I may like rice crispy treats more now than I did as a child…and I didn’t think that was possible! This recipe takes a basic dessert to a whole new level with just two additional steps: sprinkles and ¼ cup of white or yellow cake mix. 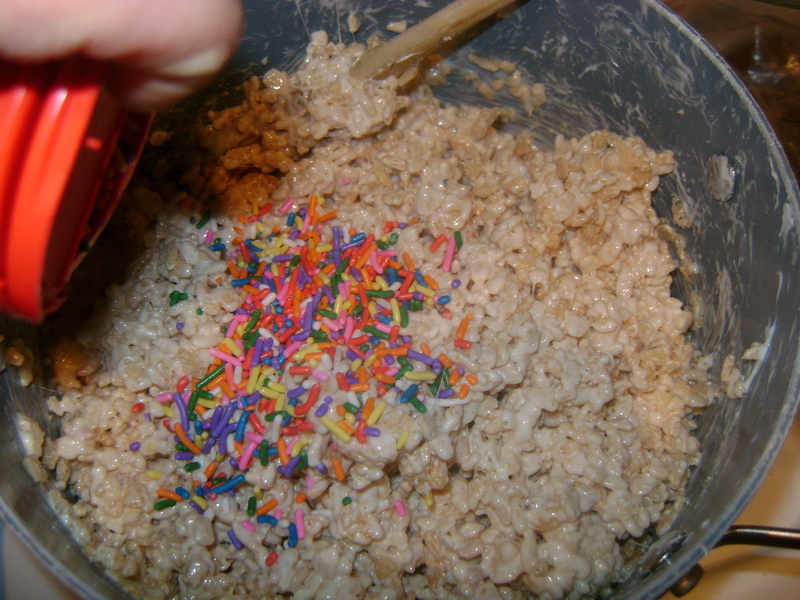 A tip: keep your mouth occupied in some way while making this treat. 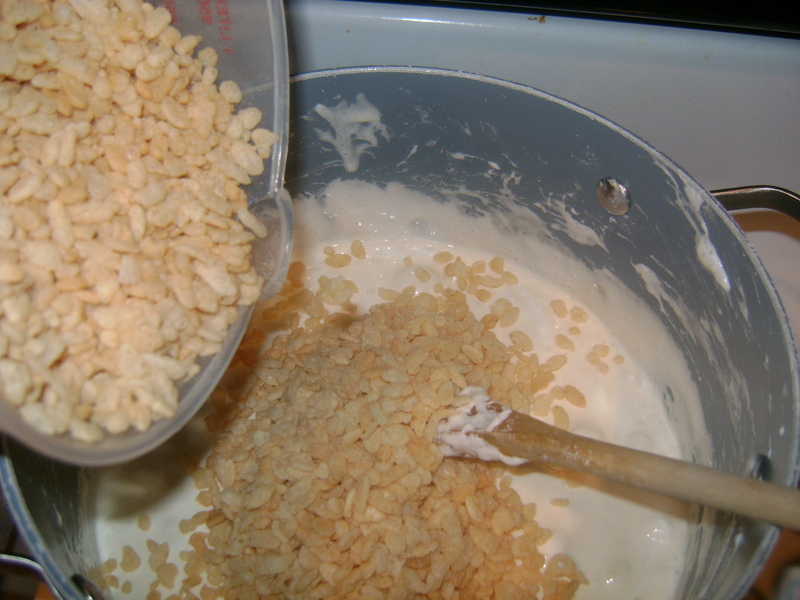 I had a REALLY hard time not eating the rice crispy cake batter while spooning it into the pan. Gum, coffee, and the fact that I made them at 9 a.m. on a Saturday kept me from eating half of the batter. Oh, and the fact that they were a gift for my Auntie M! 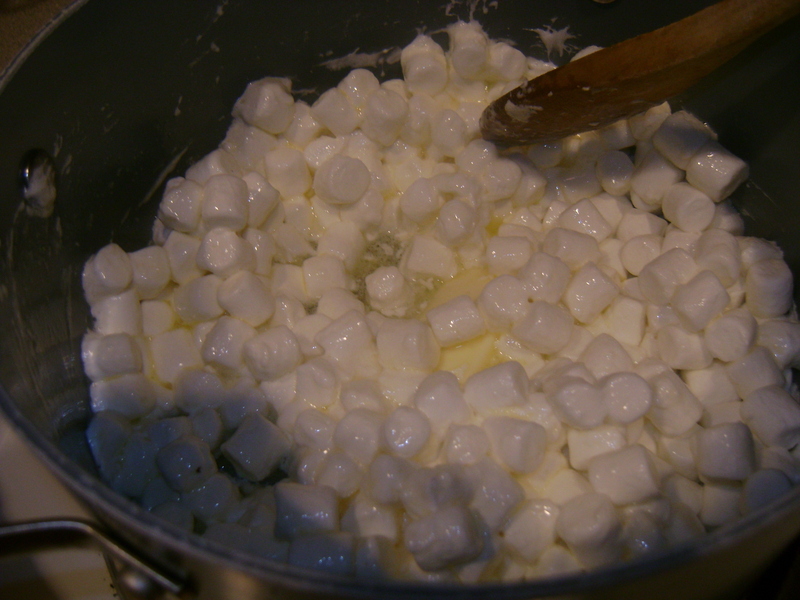 1)Melt butter in a large saucepan over low heat and add marshmallows. 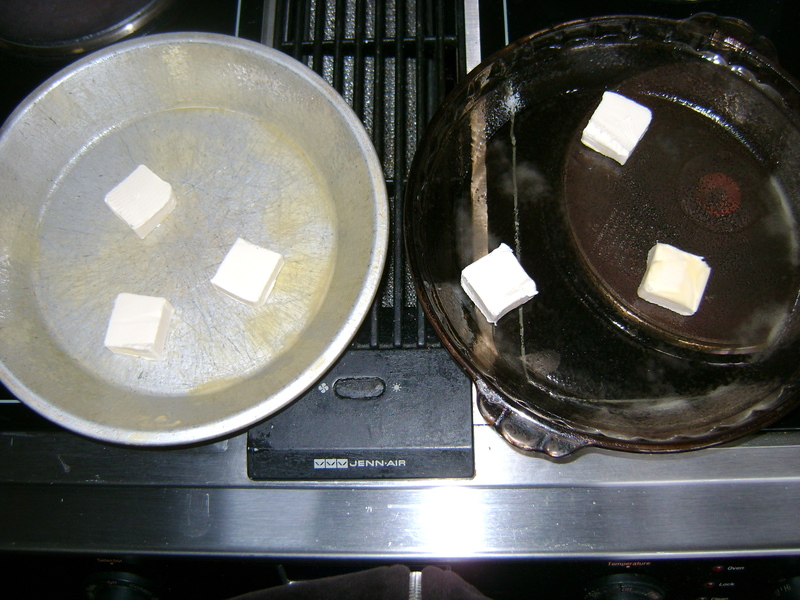 Marshmellows in butter? what could be better?? 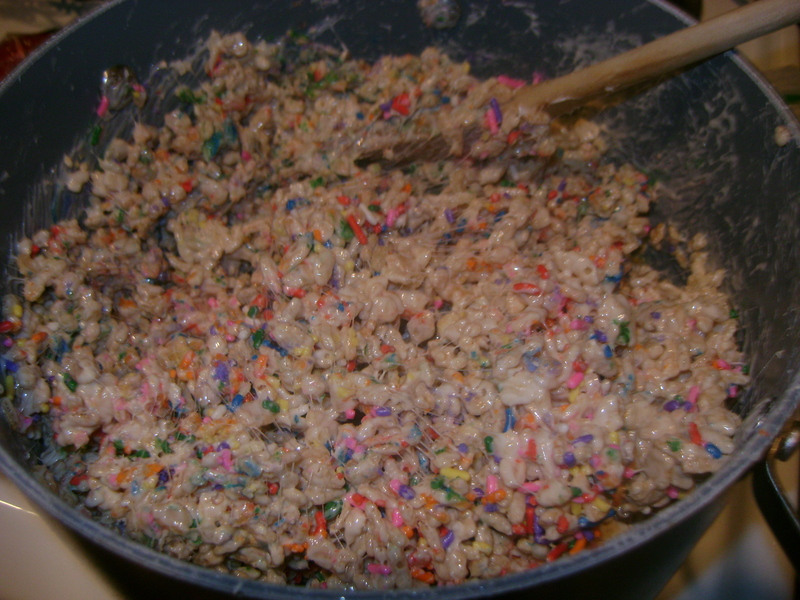 2)Stir until they begin to melt, adding in cake mix one spoonful at a time until it’s combined. 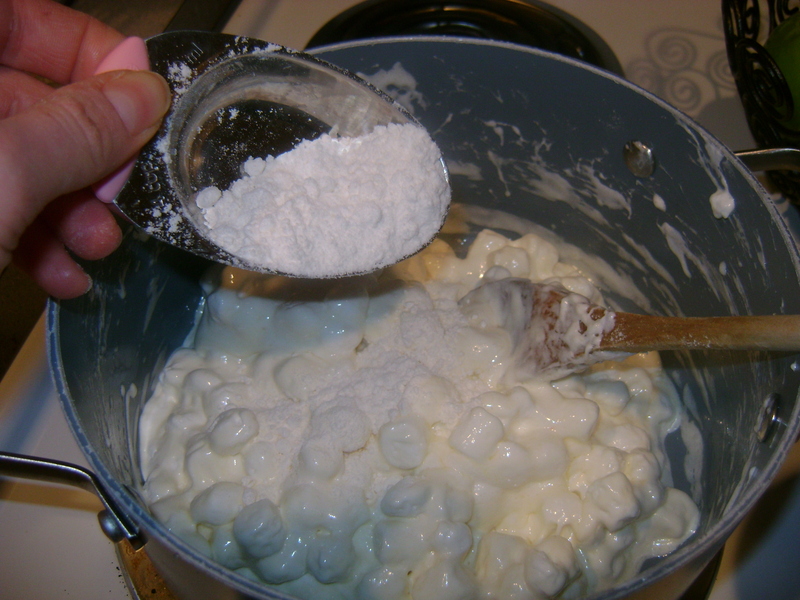 Stir in rice krispies and coat it with marshmallow mixture. I cut mine and then put them in cellophane bags to give to my Aunt Martha. Of course, I had to taste-test them first. The cake flavor shines in this recipe- keeping them light, yet decadent. Plus, the sprinkles give them an even greater birthday feel…this one’s a keeper! I’ve said it before and I’ll say it again. I love oatmeal. It fills me up for hours, warms me up in the morning, and is just plain delicious. The problem is, since I eat it at least 5 days a week, I tend to go through phases where I’m just plain sick of it. Today, I hit that phase. However, I knew once I got to my desk I’d crave something warm, filling, and syrupy. Enter—a brand new breakfast bowl. A brown rice breakfast bowl to be exact and boy was it delicious! 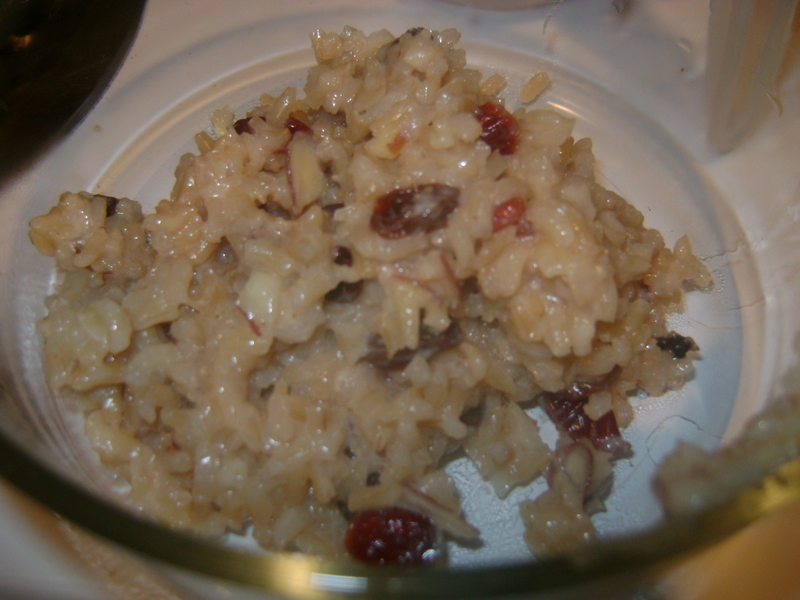 I found this recipe last year while reading Bethenny Frankel’s first book, Naturally Thin. I enjoy the book so much, I’ve read it twice, and I’m sure I’ll read it again. It’s down-to-earth, comical, and full of “real-life” advice, not your standard “diet” book. She includes her favorite recipes, and this just happens to be one of them. Before I read this, I would NEVER have thought to eat brown rice for breakfast. Rice has always been in the “dinner” category for me. Bethenny was right-on. This breakfast bowl is rivaling my favorite oatmeal bowls! To make my breakfast bowl, I used Uncle Ben’s brown “ready rice”, since that’s what I had in my cupboard. Really, any brown rice will do. Since mine was already cooked, I’m pretty sure that’s what explains the extra chewy and grainy texture of my rice. Not that I’m complaining. I loved it! This is simple to make, too. Add your rice, milk, toppings, and you have a protein packed, nutrient-dense breakfast in less than 5 minutes. 1. 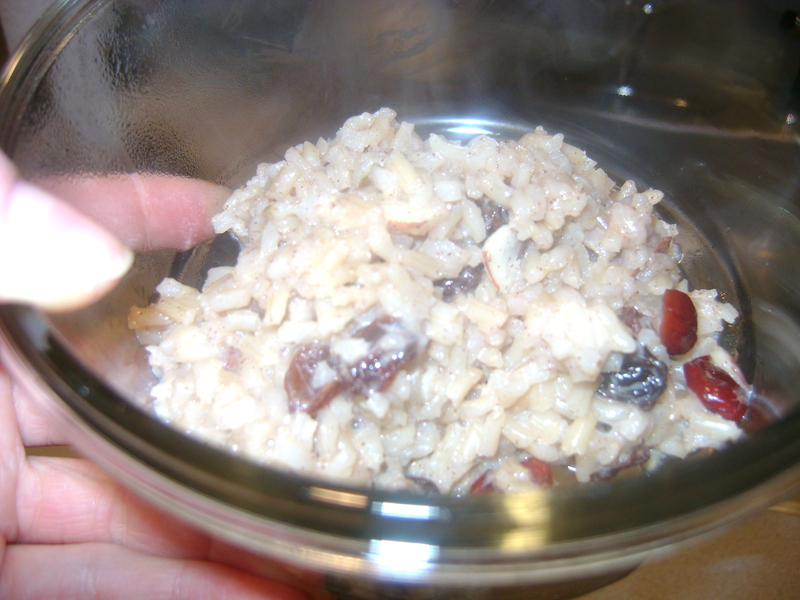 Combine brown rice with milk, cinnamon, dried cranberries or raisins,1/2 the portion of nuts, and maple syrup/brown sugar in a saucepan. 2. Heat over medium heat, stirring until desired consistency is reached. (If your rice isn’t cooked, it’ll take around 5 minutes. 3. 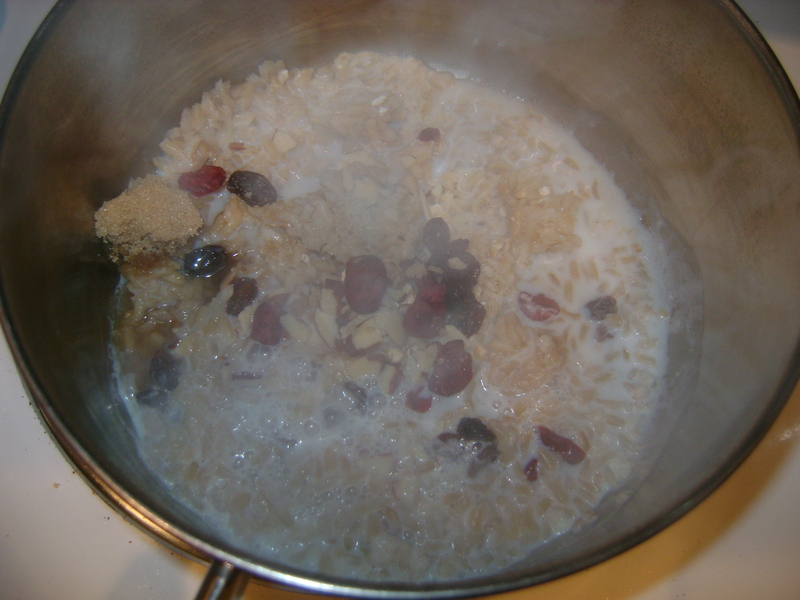 Once done cooking, top with additional nuts, cinnamon, granola, or toppings of your choice. 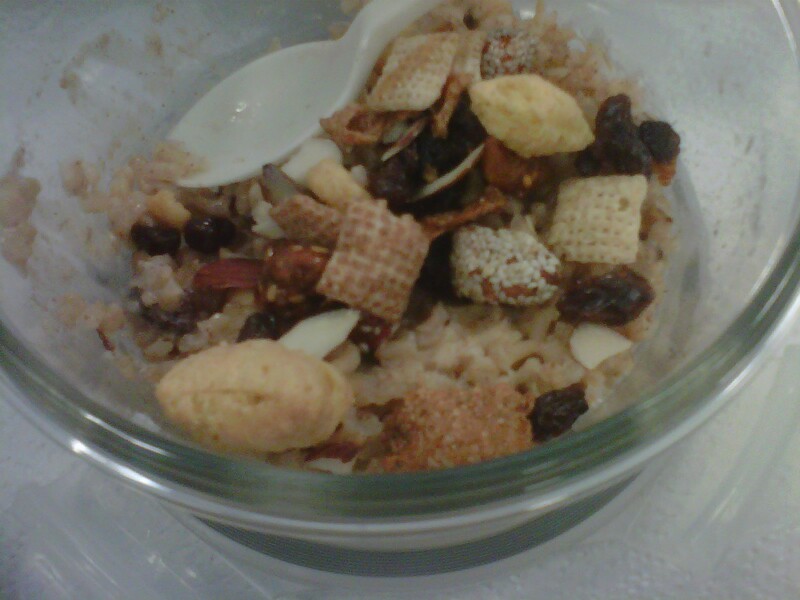 Today, I topped mine with plump raisins, Kashi go-lean crunch, cinnamon chex, glazed walnuts, and sesame seed almonds. 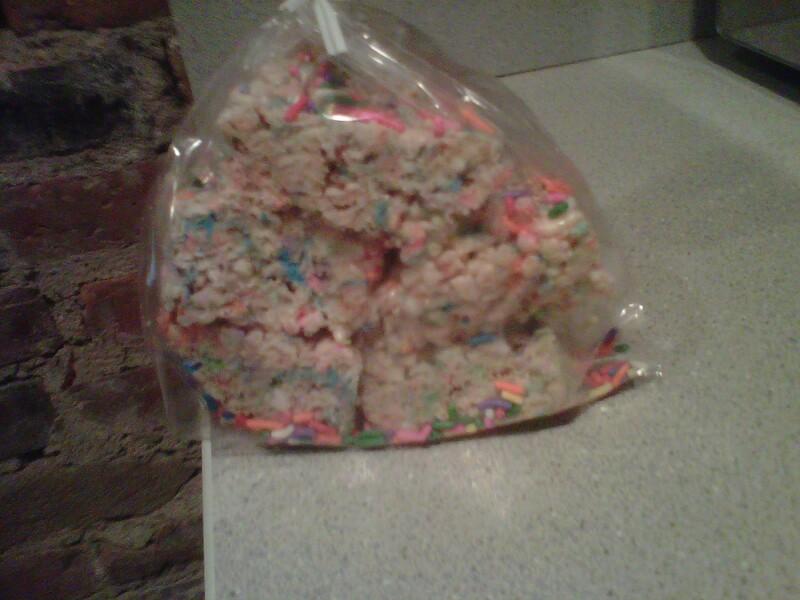 Heaven in my mouth! 1. Preheat oven to 350 degrees. 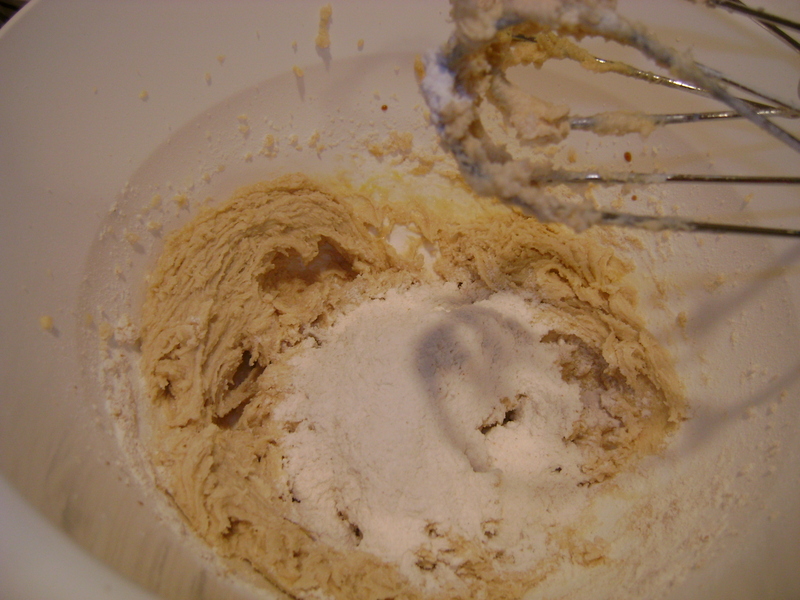 Cream butter and sugars with electric mixer until well combined. 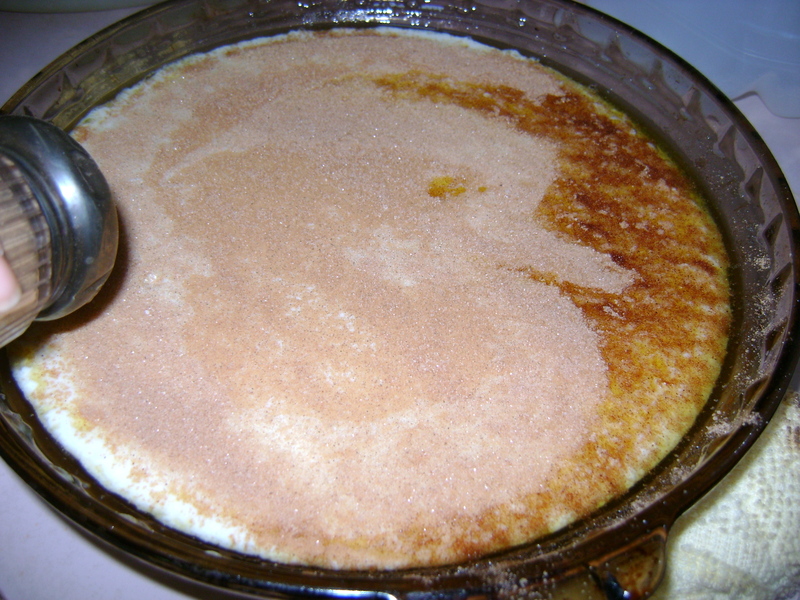 Add in eggs and vanilla and mix well. 2. 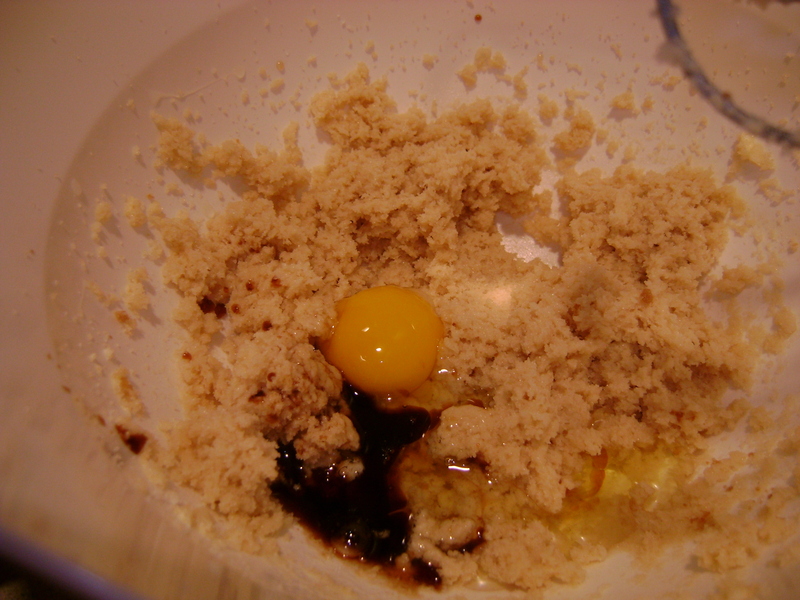 In a separate bowl mix the flour, salt and baking soda. 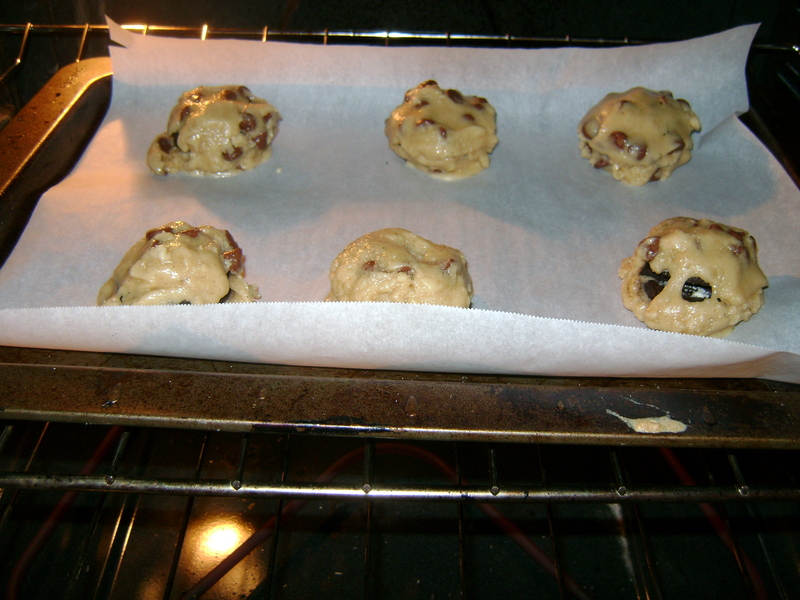 Slowly add them to wet ingredients along with chocolate chips until just combined. 3. Chill the dough for about 30 minutes. 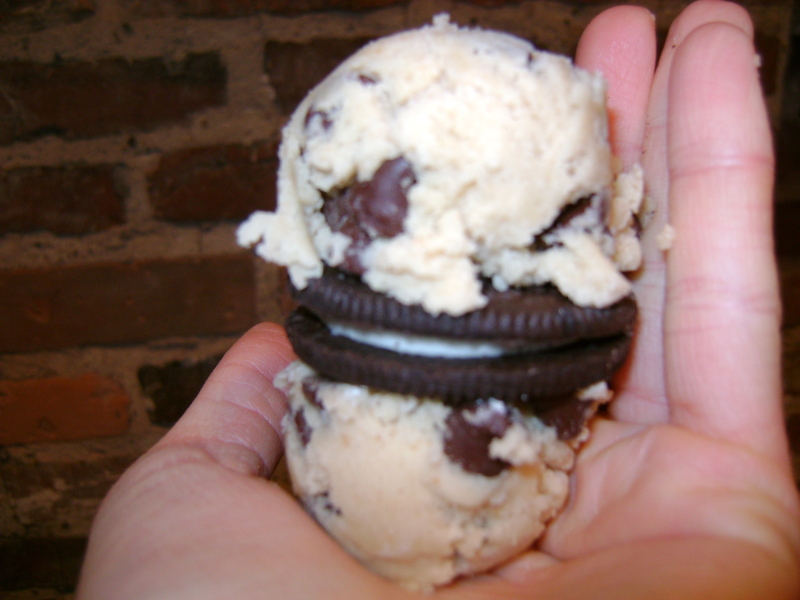 Then, using a cookie scoop, take one scoop of cookie dough and place on top of an Oreo. Take another scoop of dough and place on bottom of the Oreo. 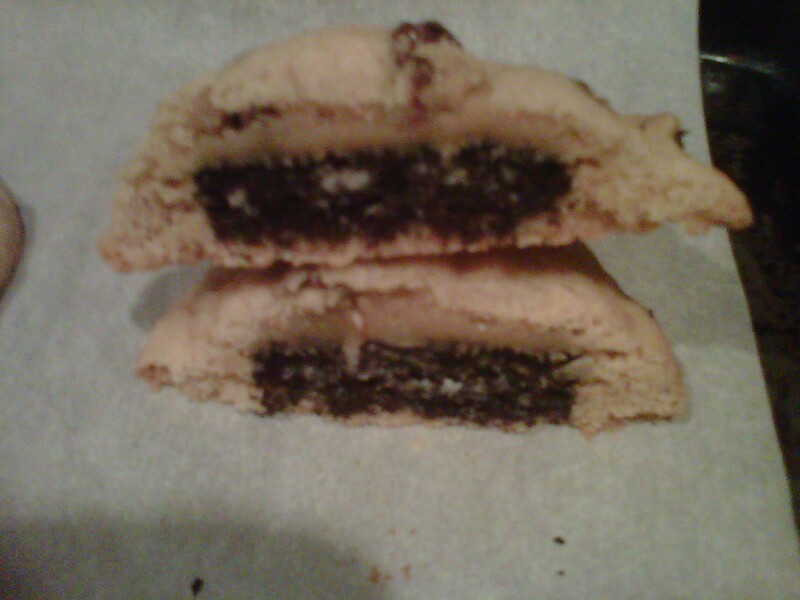 Seal edges together by pressing and cupping in hand until Oreo is enclosed with dough. 4. Place onto a parchment paper lined baking sheet and bake cookies 9-13 minutes or until the cookies are baked to your liking. I prefer them slightly undercooked. 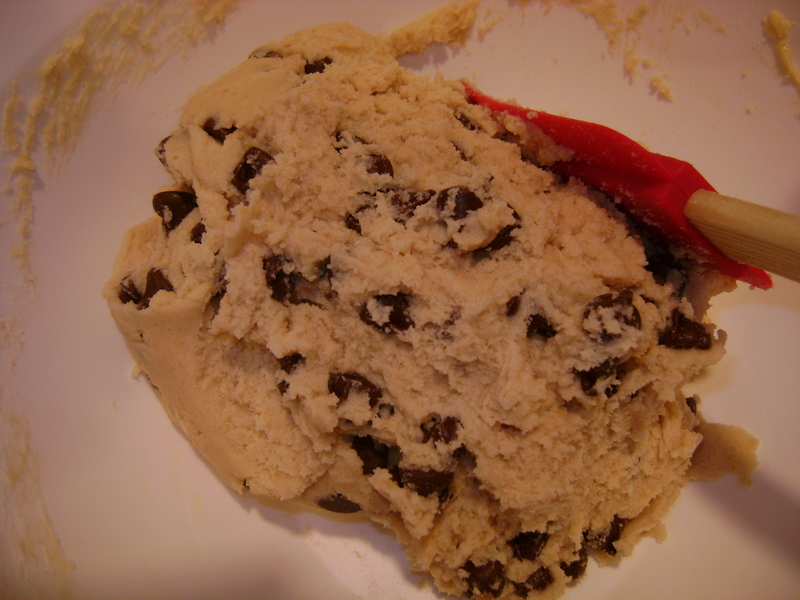 Raw dough is addictive! Let cool for 5 minutes, then transfer to a cooling rack. Serve with milk. These were enormous! 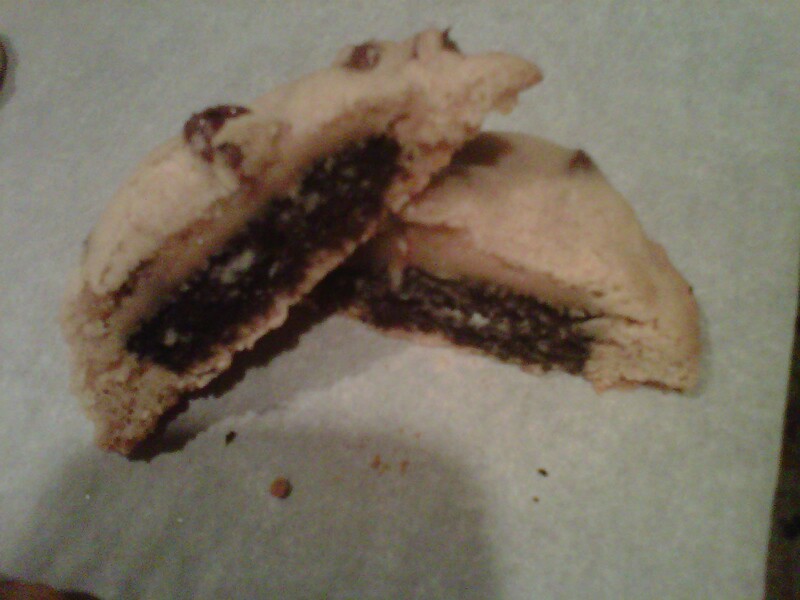 They look like double cookies, due in part to the massive amount of dough required to cover the Oreo. That’s why using a cookie scoop is a necessity. It helps dole out the perfect amount for the top and bottom of the cookie. 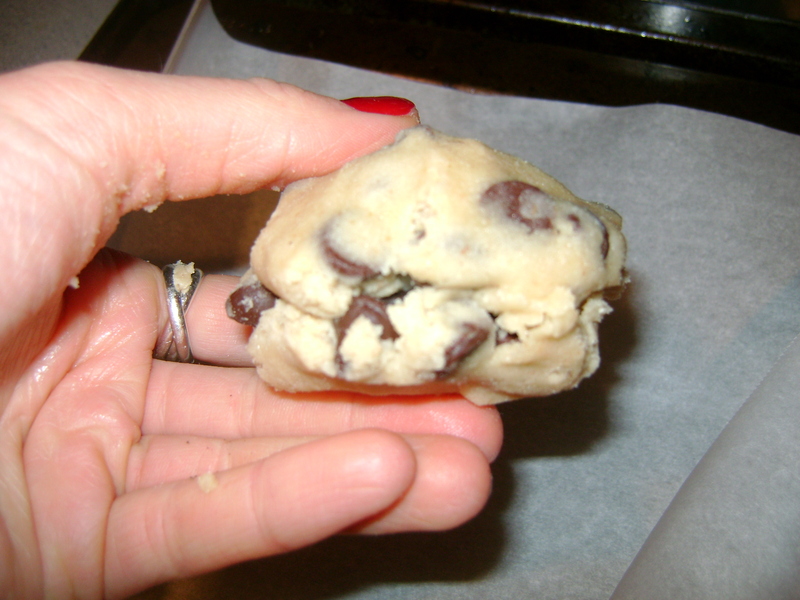 As a side note, I think chilling the dough is key to shaping the cookies into a more “circular” form. The dough wasn’t so sticky, and they were easier to press together. I dare you to try and eat just one. Get these cookies in your life…now! I finally made it home to Maine this past weekend. After 3 long months, it was about time. The best part about home, besides seeing my family, is the food that comes along with the visit. I think I miss it more now than I did in college. Really, nothing comes close to Mom’s cooking. This visit, she truly outdid herself: Date Squares were devoured, Crunchy Surprise Bars were demolished, and homemade Kenyon dip seemed to disappear within minutes. Whoops. Somehow, I still woke up hungry for Sunday brunch, and this meal topped everything, including the treats listed above. Being the breakfast lover that I am, I’m obsessed with brunch. The endless combinations, varieties, and slow pace of brunch makes the weekend feel like the weekend. While I love going out for brunch, I prefer eating it in. Since you control the ingredients you cook with, it’s usually much healthier, and this brunch was no exception. While healthy, it’s full of flavor and will make you want seconds, thirds, fourths…trust me! In my eyes, the best Rowden brunch centers around this one dish: PUFFY PANCAKE. I must warn you, you may not want a traditional pancake after you make this. Light, fluffy, and sweet …this dish is a keeper. Plus, it takes no more than 5 minutes of prep time, with minimal clean-up. Can’t beat that. We served ours along with a side of egg casserole and a fresh fruit bowl. Dynamite. So dynamite that I’m making this for dinner tonight. Don’t forget the syrup!! 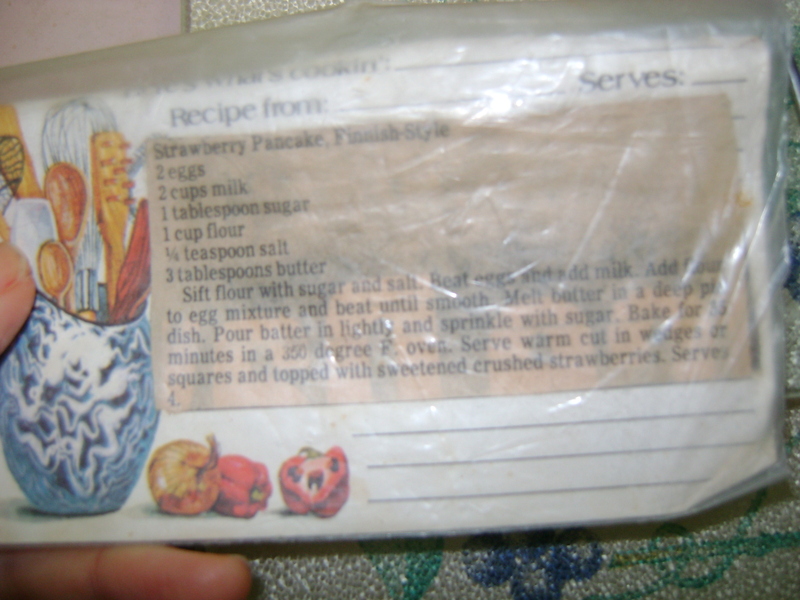 Puffy Pancake ( To make 2 pancake dishes, double this recipe). 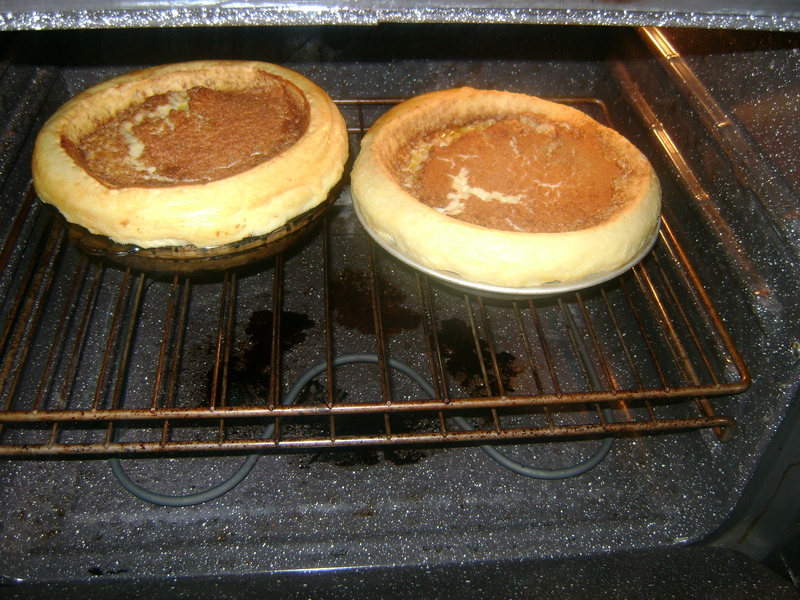 2) Place margarine in deep pie dish. Melt in oven for about 3 minutes. While it’s melting, move onto step 3! 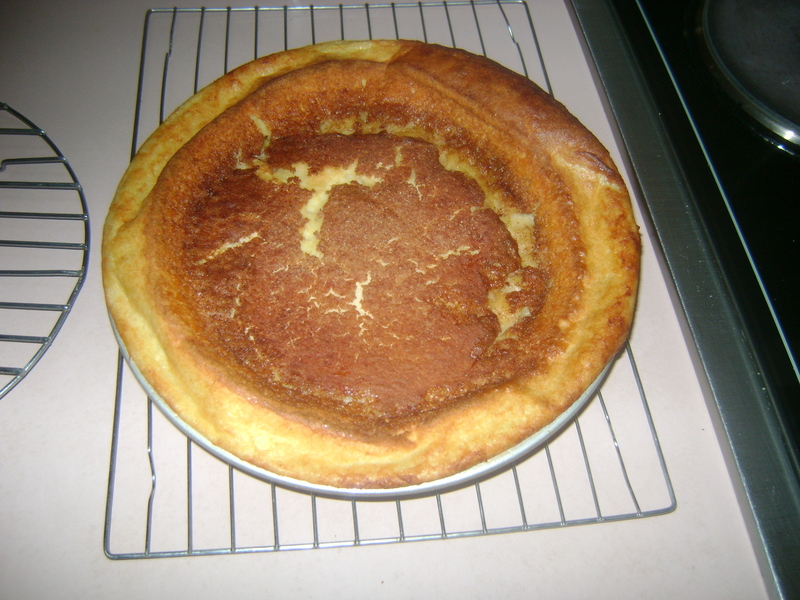 3) Measure and pour eggs, flour, sugar, and milk into a blender. 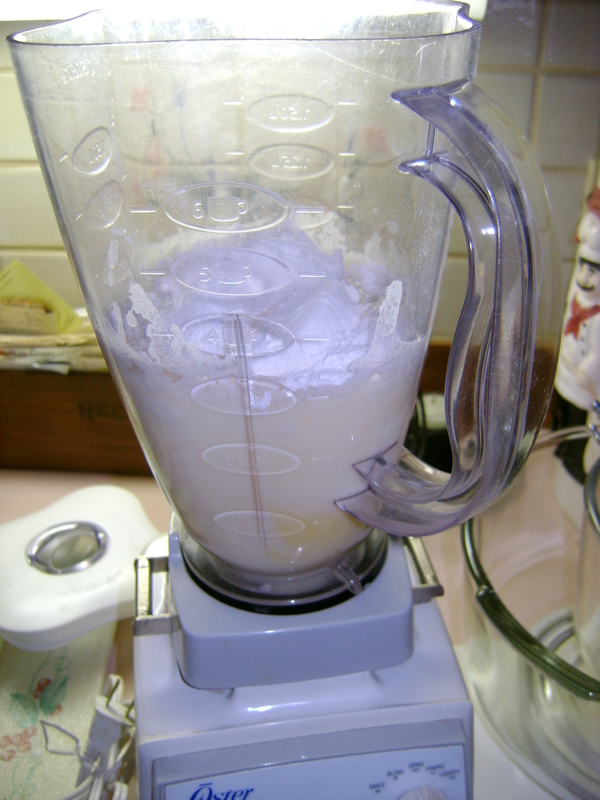 (If you don’t have a blender, pour ingredients into large bowl and use a hand-mixer). Blend together for about 30-45 seconds, or until mixed. 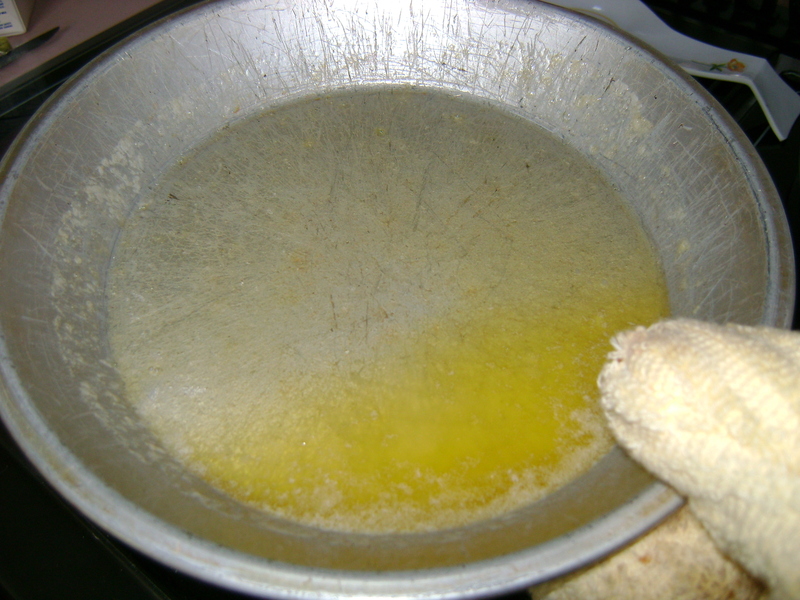 4) Remove dish with melted margarine from oven. Swirl margarine around until the pan is coated. 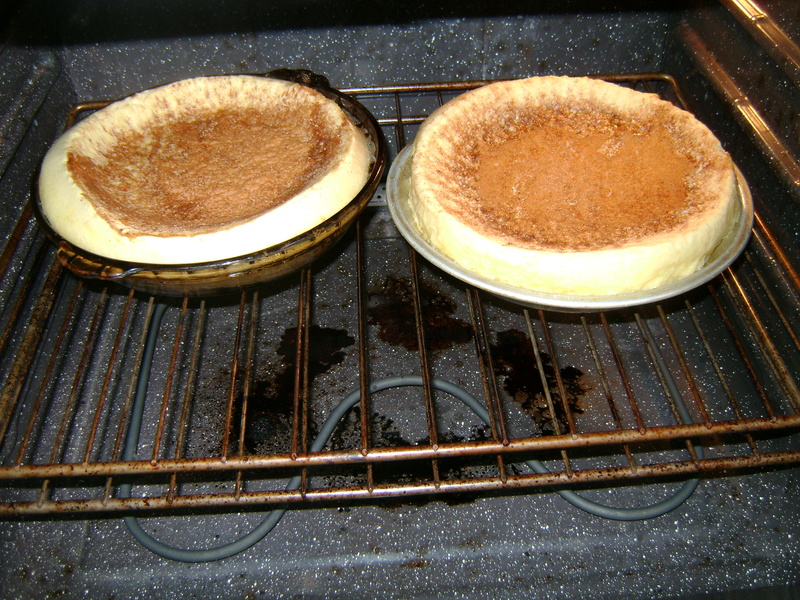 Pour ingredients into the dish, and top with cinnamon sugar. 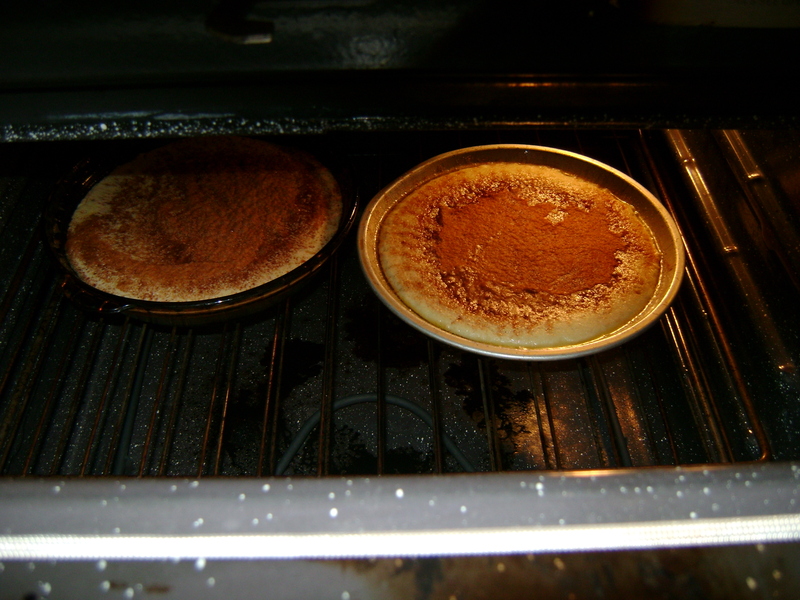 5) Bake for 40-45 minutes, or until puffy and light brown. 6) Let cool for 3-5 minutes and enjoy! My favorite part of making this is watching it “puff” up as it cooks. It’s fun to see it progress, but it’s more fun to eat. I have a hard time waiting for it to “cool”, which typically results in a burnt tongue! One batch will typically serve 3-4 people. In our family, it serves 3. We usually double the recipe to make two batches. You may want to, too, it disappears quickly! Off to make my dinner. Enjoy! What’s your favorite brunch recipe?